The goal for this training is to identify the hormone triggers that affect fat burning and fat storing. This is important because if you don’t think of your food and lifestyle choices in terms of the hormones they trigger, it becomes very difficult to adhere to any meal and exercise plan long term. So let’s dive straight in and walk you through the hormone triggers framework. You can find an image of it below or download the pdf version of it here. I’ve organised the triggers into 2 groups, fat storing and fat burning. Each group starts from bottom to top. Let’s start by looking at the fat storing triggers. Refined Carbs, Added Sugar and Grains & Starches. You can probably guess why they’re at the base. These 3 triggers produce the most amount of fat storing hormone, insulin. Insulin, even in small quantities nullify all of the fat burning hormones. It probably goes without saying why added sugar would be at the base. We’ve all heard a lot about the effects of sugar in the diet, but worse than added sugar is refined carbohydrates. This grouping of foods actually have a larger effect on Insulin production and fat storing than sugar itself. 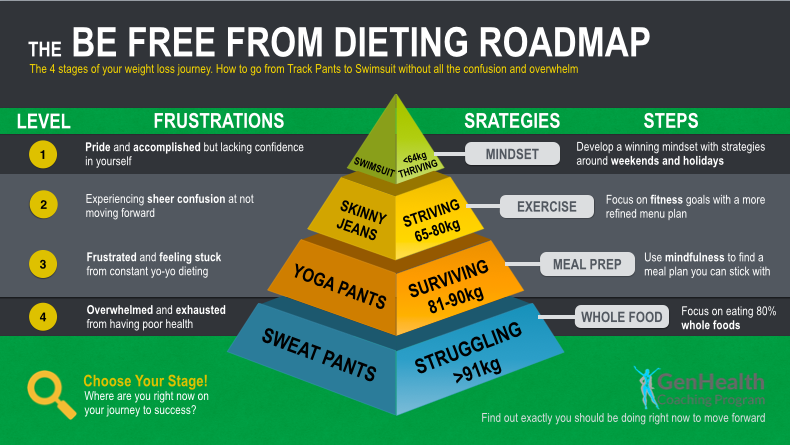 In my signature GenHealth Coaching Program, we have a framework called the Be Free From Dieting Roadmap which identifies the 4 stages of the weight loss journey from Struggling to Thriving or what I like to call Sweatpants to Swimsuit. To move past the struggling stage of the weight loss journey it become necessary to eliminate Added Sugar and Refined Carbs from the diet. As far as grains and starches go, this grouping of foods are generally whole foods and do have health benefits. 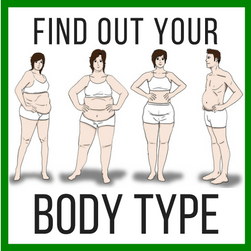 However, too many grains and starches in the diet, produce the main fat storing hormone, insulin. Stress, Hidden Sugars, Excess Protein and Fruits. These triggers are a little less obvious but still produce levels of fat storing hormone that can prevent you from losing the stubborn find of fat. Stress activates the belly fat storing hormone Cortisol. Stress is cumulative and comes from many different areas. First and foremost, new stress triggers need to be dealt with. Having good stress release practices in your life is essential. Regular self care activities like, massage, taking relaxing bath, meditation are all example of stress release techniques. The next 3 triggers… hidden sugars, excess protein and fruits, are all triggers of insulin. Some fruits can produce insulin in amounts that prevent fat burning so it’s recommended to consume the smallest amount of fruit possible until you reach your goals. Excess protein, actually triggers insulin in the same way as carbohydrates so it’s important not to over consume. And hidden sugars, are the ones found in juices, sauces, dressing, marinades, flavoured yogurts, pretty much everywhere you look these days there’s hidden sugars. Estrogen mimickers and Artificial Ingredients. Estrogen mimickers have an effect on the fat burning hormone estrogen. The main culprits are soy based products. Other culprits are chemical preservatives in skin care, the overuse of plastics like food containers and drinking bottles, chemicals sprayed on our food and the contraceptive pill. Artificial ingredients are food colours, flavours and sweeteners. Often these are hidden in our foods. Especially the flavour enhancer, MSG which is commonly used in asian restaurants. Remember, in order to progress through the different stages of your weight loss journey it becomes a higher and higher priority to address the hormone triggers associated with each stage. 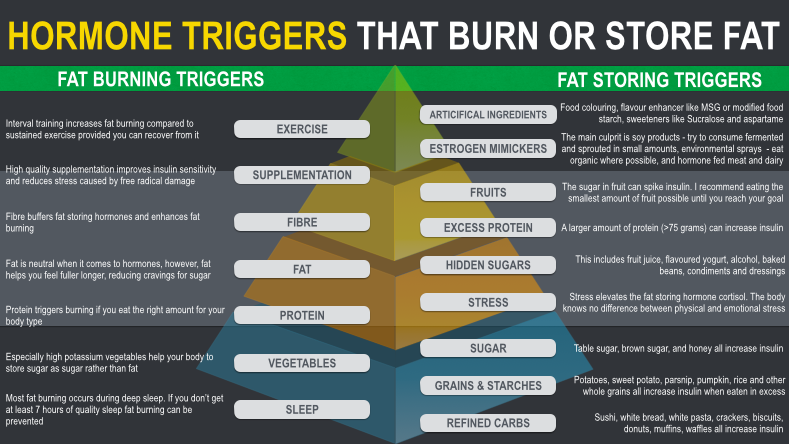 Lets jump over to the fat burning triggers now. The most fat burning occurs while you sleep. If you’re not getting at least 7 hours of quality sleep per night then it’s likely that fat burning is being prevented. Switching to a whole food diet and managing stress both help to improve sleep quality. With vegetables, it’s the potassium in the veggies that we’re really after. Potassium helps your body store sugar as sugar, rather than sugar as fat, and is needed to help balance blood sugars. Protein in the right amounts, triggers fat burning hormones. If your liver is not functioning well, you need to consume even less of it. Fat is neutral when it comes to fat burning hormones, however it helps you feel fuller for longer which prevents hunger cravings. And fibre, especially from vegetables, buffers, or slows down fat storing hormones and enhances fat burning. By supplementation I mean, a high potency, broad spectrum multivitamin at the very least. This triggers fat burning by reducing nutrient deficiency hunger cravings and improving your sensitivity to insulin. Exercise triggers the most amount of fat burning hormones. The reason it’s at the top of the pyramid though, is because, to get the full fat burning effects from exercise requires the other hormones triggers to me mastered. The right ratio of high:low intensity exercise is required to get the full fat burning effects. 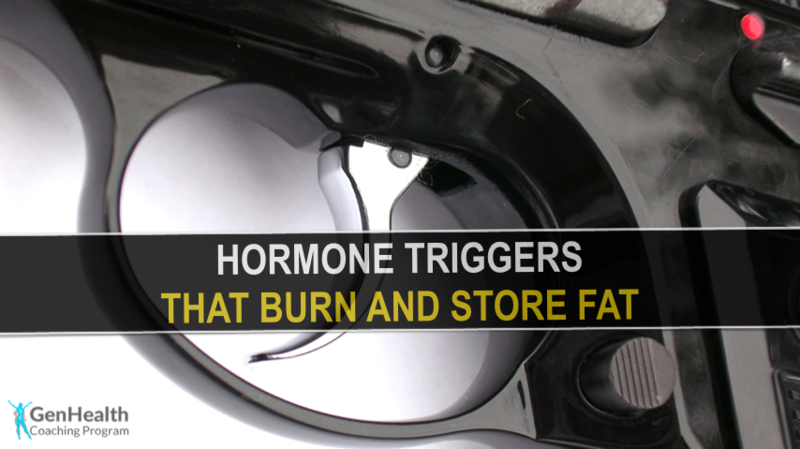 So there you have the hormone triggers that burn or store fat. Hopefully it’s given you another perspective to be viewing your food and lifestyle choices. 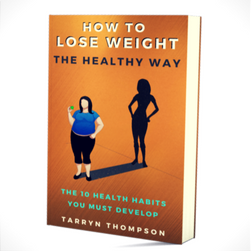 Once again, study the pdf download of this framework and begin by focusing on the triggers most relevant to your stage of the weight loss journey. If you need more help, leave a comment below or check out the replay of my latest webinar training. How To Lose Stubborn Fat and Keep It Off. No Comments to "The Hormone Triggers That Burn And Store Fat"